Allegro MicroSystems: The ACS724 and ACS725 from Allegro MicroSystems Europe are two new current sensor ICs designed to offer economical and precise solutions for AC or DC current sensing in industrial, automotive, commercial and communications applications. Both devices feature differential current sensing in order to reject common-mode fields and improve accuracy in magnetically noisy environments. 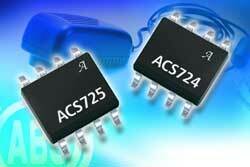 Internal galvanic isolation also allows the ACS724 and ACS725 to be used in high-side current sensing applications. The ACS724 (5 V) and ACS725 (3.3 V) are highly accurate devices with a very small package size, making them ideal for space-constrained applications where overall costs can be reduced due to a smaller board area. Typical applications include motor control in automotive power braking applications, oil and transmission pumps, or HEV charging circuits. The sensors are also well suited for load detection and management, switched-mode power supplies, and overcurrent fault protection in industrial, computer and consumer applications tied to line voltage. Each device consists of a precise, low-offset, linear Hall sensor circuit with a copper conduction path located near the surface of the die. Applied current flowing through this copper conduction path generates a magnetic field which is sensed by the integrated Hall IC and converted into a proportional voltage. The inherent device accuracy is optimised through the close proximity of the magnetic field to the Hall transducer. A precise, proportional voltage is provided by the low-offset, chopper-stabilised BiCMOS Hall IC, which is programmed for accuracy after packaging. The output of the device has a positive slope when an increasing current flows through the primary copper conduction path used for current sensing. The internal resistance of this conductive path is typically 1.2 milliohms, leading to low power losses. The terminals of the conductive path are electrically isolated from the sensor, allowing the ACS724 and ACS725 to be used in high-side current sense applications without the need for high-side differential amplifiers or other costly isolation techniques. Both devices are provided in a small, low-profile surface mount SOIC8 package. The leadframe is plated with 100% matt tin, which is compatible with standard lead (Pb) free printed circuit board assembly processes. Internally, the device is Pb-free, except for flip-chip high temperature Pb-based solder balls, currently exempt from RoHS. The devices are fully calibrated prior to shipment from the factory.